PHOENIX – The rolling, golden hills and towering mountains of southern Arizona sit under the bright morning sun in mid-March, providing the backdrop as a private jet skids to a halt along the runway at a small airport outside of Nogales, Ariz.
Miguel Pompa Corella emerges from the jet onto the tarmac, immediately being welcomed to the U.S. by Nogales Mayor John Doyle and a small contingent of local leaders and businessmen. Pompa is secretary of state for the northern Mexican state of Sonora, which shares the border with Arizona. 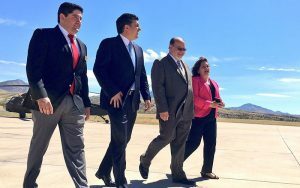 Pompa’s arrival coincides with a visit by Arizona Secretary of State Michele Reagan, who also made her way down to Nogales for the day. 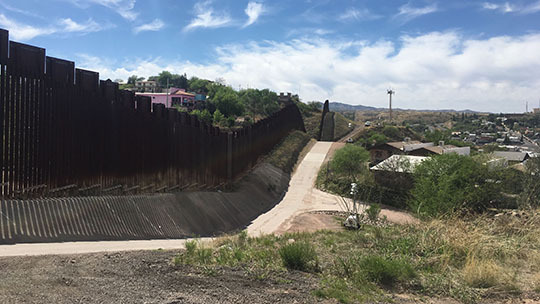 Both are part of a luncheon put on by the Nogales Chamber of Commerce to meet and promote economic cooperation between Arizona and Sonora – and more broadly, the U.S. and Mexico. The talks about economic ties come amid criticism by President Donald Trump toward the North American Free Trade Agreement, also known as NAFTA, which has tied the U.S., Mexican and Canadian economies together through trade liberalization and lifting tariffs and trade barriers. Trump has called NAFTA the “worst trade deal in history,” citing losses of American jobs and prosperity to NAFTA trade partners Canada, and particularly, Mexico, and has promised to renegotiate the pact to offer greater benefit to the U.S. economy. U.S. Commerce Secretary Wilbur Ross also recently expressed frustration with Congress for not yet initiating a re-negotiation process, a signal that the conversation over trade policy will likely heat up in the coming months. Though debate has raged on about NAFTA’s true impact on the U.S. economy since it was signed into law by then-President Bill Clinton in 1994, the general consensus among economists is that NAFTA has had a positive, if modest, actual impact on the U.S. economy. Canada made up less than 5 percent of U.S. GDP at the time it was signed. Proponents of the trade agreement, however, argue for “NAFTA and other free trade agreements for expanding trade and economic linkages between countries, creating more efficient production processes, increasing the availability of lower priced consumer goods, and improving living standards and working conditions,” the Congressional Research Service report reads. Opponents of NAFTA say that trade agreements are to blame for a decline in U.S. wages and the transfer of manufacturing jobs to Mexico by companies seeking cheaper labor. They also point to “disappointing employment trends” and say NAFTA hasn’t done enough to improve labor standards and environmental conditions, according to the Congressional Research Service. Despite the conflicting opinions on NAFTA, Mexico and Canada remain Arizona’s number one and number two trading partners, respectively, according to a report by the University of Arizona detailing Arizona trade with Mexico and Canada. “We thrive on international trade,” Doyle said. “The relationship (with Mexico) has to be strong. In 2016, Arizona exported roughly $8.3 billion in goods to Mexico, while importing $7.4 billion from its southern neighbor, according to the website UA created to track trade between Arizona and NAFTA partners. “A lot of Arizonans don’t realize how much is being imported to Arizona from Mexico,” Reagan said. “One of the things that I was most fascinated by my first visit in Nogales is the amount of agriculture, things that aren’t grown in the United States that are imported. “People don’t realize that; they just pick them up from the grocery store, buy them and eat them, and they don’t realize that it’s grown in another country and there’s an actual chain of how that gets into their pantry,” Reagan said. Lance Jungmeyer, president of the Fresh Produce Association of the Americas, says NAFTA has given consumers in the U.S. access to cheap produce year-round, something he says did not exist in the same capacity that it does today, prior to NAFTA’s implementation. “I would say NAFTA has opened up a new world for consumers in both countries and business has followed that,” Jungmeyer said. “For American consumers, that’s been able to offer good- priced, high-quality fruits and vegetables in the wintertime. “In Mexico, they’ve been able to have good access and good prices to U.S. agricultural items. Corn, chicken, pork, Washington apples, California grapes. The markets for all those things have grown a lot as a result of NAFTA,” he said. 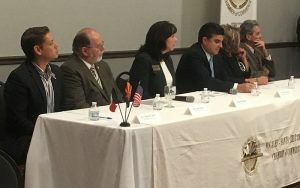 Mexican officials call for strengthening trade relationship with U.S.
Certain pockets of industries have been hit harder than others, and Arizona has been a greater beneficiary of NAFTA trade than other states – like Michigan – where the automotive industry has seen job losses over the past two decades. The automotive sector of the economy has lost roughly 350,000 jobs – a third of the industry – since 1994, according to a report put out earlier this year by the Council on Foreign Relations, a foreign policy and international affairs think tank. Economists, however, don’t attribute those losses to trade policy, but rather to technological advancement that has proliferated automation in industry. U.S. manufacturing output since 1980 has nearly doubled, and tops the combined output of China and Japan, the next two largest world economies, according to the Bureau of Labor Statistics. Conversely, the level of employment in the manufacturing industry has been on a steady decline since 1943, when the sector peaked at a 38 percent share of the nation’s total employment. Manufacturing now makes up less than 9 percent of total employment in the U.S.
Manufacturing has been on a steady decline in wealthy countries around the world, as well. According to the Bureau of Labor Statistics, Sweden, Germany, and the Netherlands have seen similar – if slightly less drastic – declines in the manufacturing sector. Another report published by the National Bureau of Economic Research in January 2016 suggested much of the economic losses suffered by the U.S. in the NAFTA era are the result of the emergence of China as a global economic power, particularly in the manufacturing sector. In his inaugural address, Trump referred to “rusted-out factories scattered like tombstones across the landscape of our nation,” and has cited this loss of manufacturing jobs in America’s Rust Belt and the U.S. trade deficit with Mexico as attacks on NAFTA. Trade deficits have become political fodder for lawmakers to use in attacks on trade agreements, but economists disagree with the concept of trade deals being necessarily harmful for the U.S. economy. The Peterson Institute for International Economics, in a 2014 paper, explained the logic behind deficits being a necessary part of global trade. Trump, whose economic plan his own advisers have described as an “economic nationalist agenda,” coupled with his fiery, anti-immigrant rhetoric and border wall proposal, have led the U.S.-Mexico relationship to become strained on a national level. Cooperation with Mexico has become a focal point for some Arizona lawmakers, however. Sen. John McCain, R-Ariz., issued a statement in January criticizing Trump’s promise to renegotiate – or altogether pull out of NAFTA, and affirmed Arizona’s commitment to the trade deal. “Facts are stubborn things, and the facts clearly show that NAFTA has delivered enormous economic benefits to the citizens of my home state since it went into effect in 1994,” McCain said in the written statement. “The free flow of trade has been the foundation of U.S. economic policy for decades, and a major factor in our prosperity and greatness…Retreating from NAFTA and other international trade agreements will harm our ability to compete in today’s global economy, raise costs for consumers, threaten job, and undermine our relations with our closest neighbors,” McCain said. Reagan, who also affirmed her commitment to cooperation between Arizona and Sonora, said her goal is to educate Arizonans on the importance of trade with Mexico, and what that could look like moving forward. Mendez says that trade with Mexico has actually helped keep U.S. jobs here, rather than being shipped to a non-NAFTA trade partner. The flow of manufacturing has been broken up with companies sending vehicle parts such as wiring harnesses to be assembled in Mexican factories like those in Ciudad Juarez, by cheaper labor. The parts are then sent over to the U.S. to be further put together by American workers, Mendez explains. “That allows the other part of manufacturing to stay in the U.S. It was able to reduce cost by shipping that component, that part, and producing it at a lower cost,” according to Mendez. This lowers costs for American consumers and allows companies to maintain assembly plants in the U.S. rather than ship the entire operation overseas, Mendez said. “The trade deficit might have changed, but the economic activity more than makes up for that,” Jungmeyer said. “You’re finding a lot more jobs in the United States that otherwise would not have been there. “To take away NAFTA and global trade hurts agriculture. It’s simply not a zero-sum game. You have to look deeper,” Jungmeyer said. It’s unclear what parts of NAFTA Trump is exactly planning to overhaul or renegotiate, but for economists like Mendez, the politicization of trade agreements like NAFTA is frustrating because politicians he says, often misrepresent complex ideas to gain political traction. For industry leaders in Arizona like Jungmeyer, though, reviewing and adjusting NAFTA isn’t seen as a bad thing, given the age of the pact and changes industries have gone through since the mid-1990s.